Planning permission has been granted to architects, All Design, for an outlandish and iconic shopping centre and office development in Nairobi, Kenya. The Beacon will be the only African project produced by the late legendary British architect Will Alsop who designed it before his death in May 2018. Proposed for central Nairobi, The Beacon is described by All Design as an open-air mall and will feature a monorail with “jellybean” carriages and a “piano staircase”. It will contain 24,300 square metres of retail, food and beverage space, as well as a 4,200sq m seven-storey office tower overlooking the shopping centre’s roof garden and bar. 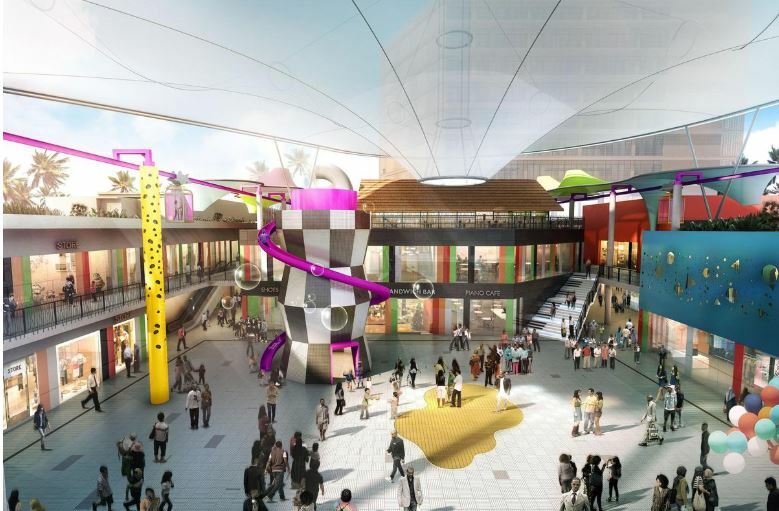 According to the design team, the shopping centre is designed around the theme of a sweet factory to “fulfill Alsop’s desire that architecture should always be fun”. The building’s main facade will be typical of Alsop’s bright and playful designs, with monochrome porcelain panels broken by a large red ‘leisure box’. Walkways will be sheltered by colourful fabric canopies, while rooftop canopies will boast a thatched roof. “The Beacon is intended to bring delight to locals and tourists; the vivid colours and striking patterns of the façade will hint at the amusements and leisure facilities inside,” said the architects in a statement. 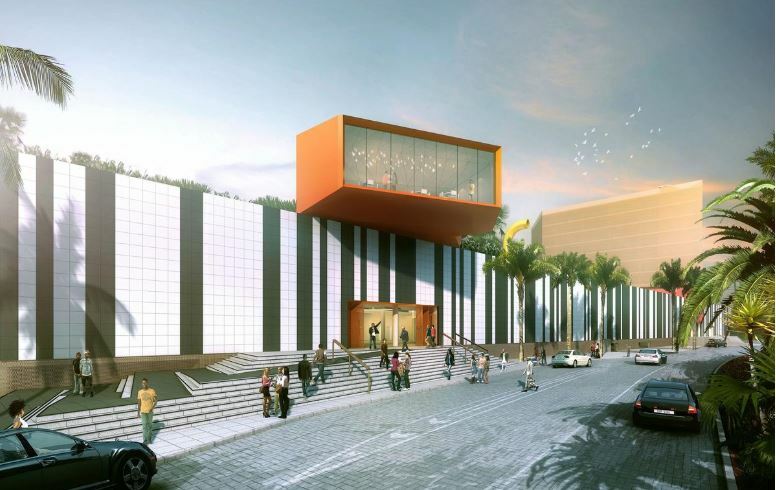 The shopping centre and the seven storey office tower are backed by London- and Nairobi-based developer Kiloran, and are expected to be complete in 2020. 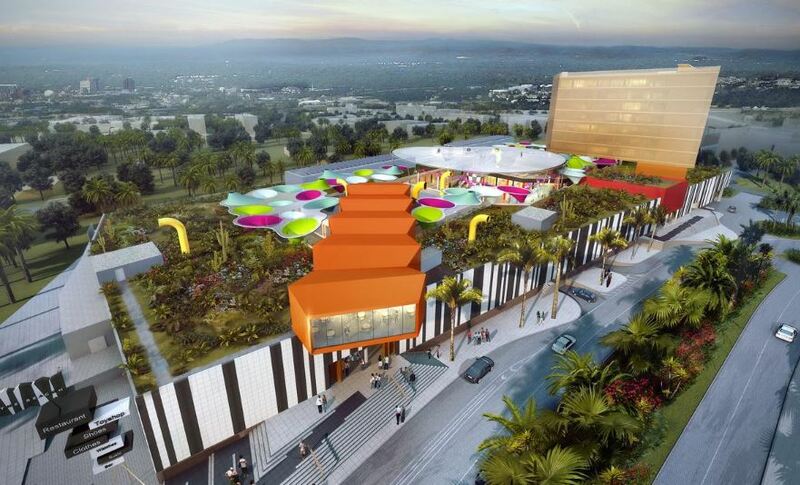 “We were intrigued by Kiloran’s ideas for this mall in Nairobi and were pleased to be able create an open-air mall with a focus on sustainability, fun, and family which we believe to be key drivers on future international mall design,” said Marcos Rosello, co-founder of All Design. The complex will be located between Nairobi’s central business district, its industrial area and the Upper Hill financial district. Will Alsop died on 12 May 2018, aged 70, following a short illness. Described as “one of architecture’s biggest characters and talents”, his legacy includes the turquoise Peckham Library in London and the stilted Sharp Centre in Ontario. The Beacon marks the continuation of the work of All Design, which he founded in 2011. It joins a series of large-scale proposals for Nairobi, which has become a centre for Africa’s tech innovations.